perhaps nothing happened in the 90s. 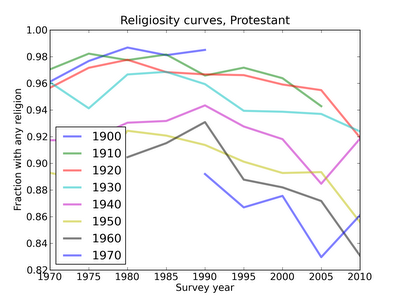 and since most believers are partly foxhole believers, without major crises religiosity declines. 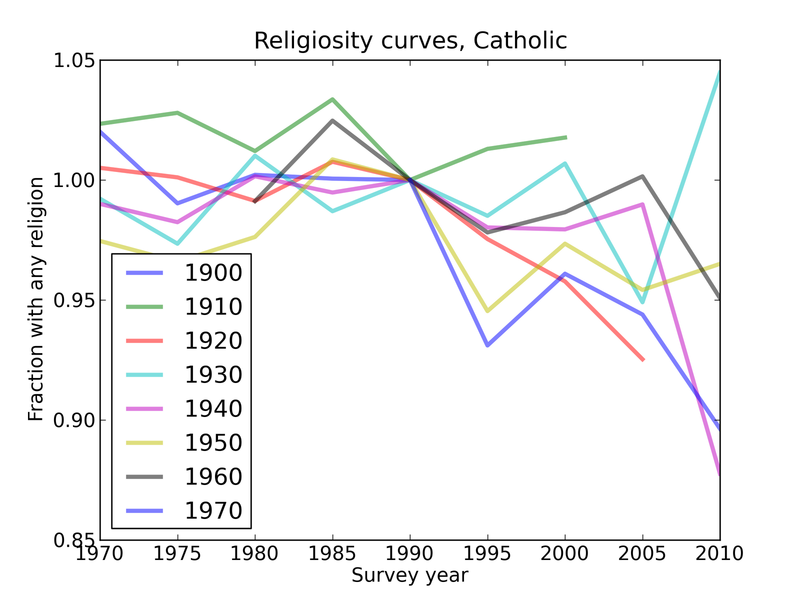 world wars, financial depressions should ramp up religious belief. 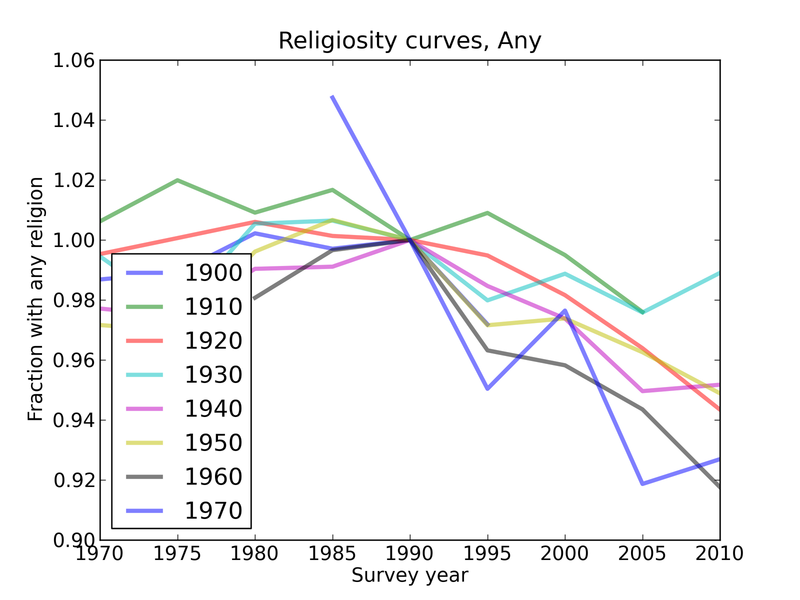 It is true that 90s was a time of prosperity, and since religion functions as ex-post insurance for a majority of people, religious participation decreases in good times. 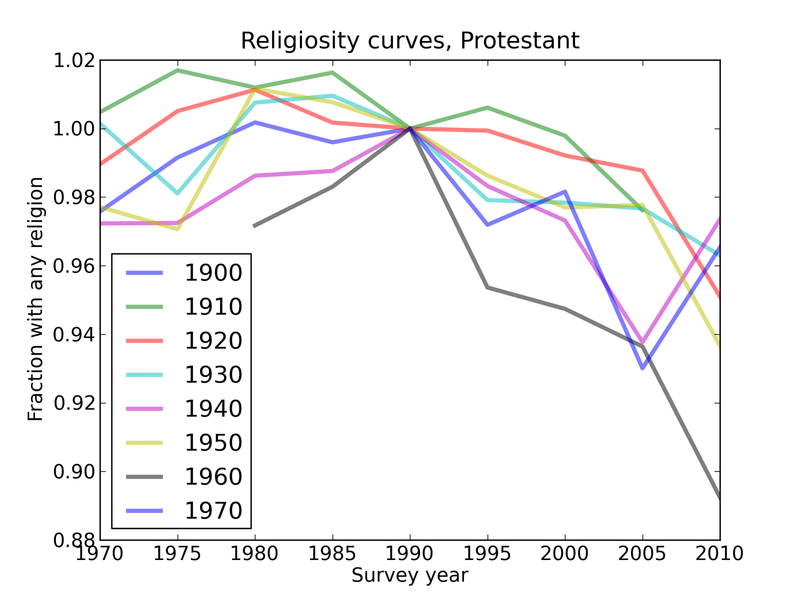 However, I don't think a catholic or a protestant will become disaffiliated as a result of good economy and peace. 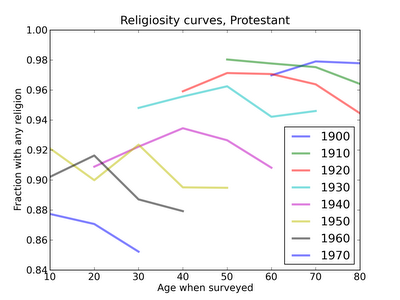 I would expect church attendance rates to fall for this reason, but not religious affiliation. Both our comments stem from intuition. Perhaps there is some way to test this theory. 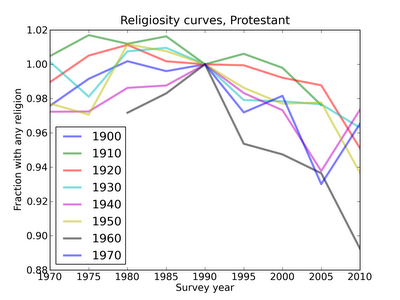 I tried to look for localized disasters during the 90s which would according to my hypothesis promote religiosity. The only thing I came up with is the 1987 L.A. quake. I do not have the local data, but perhaps Allen or someone else does. Maybe I am missing another obvious disaster. 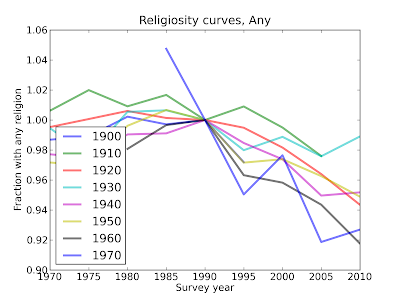 In any case I would expect levels of religiosity in L.A to decline less than the national average in the 1987-1990 period. 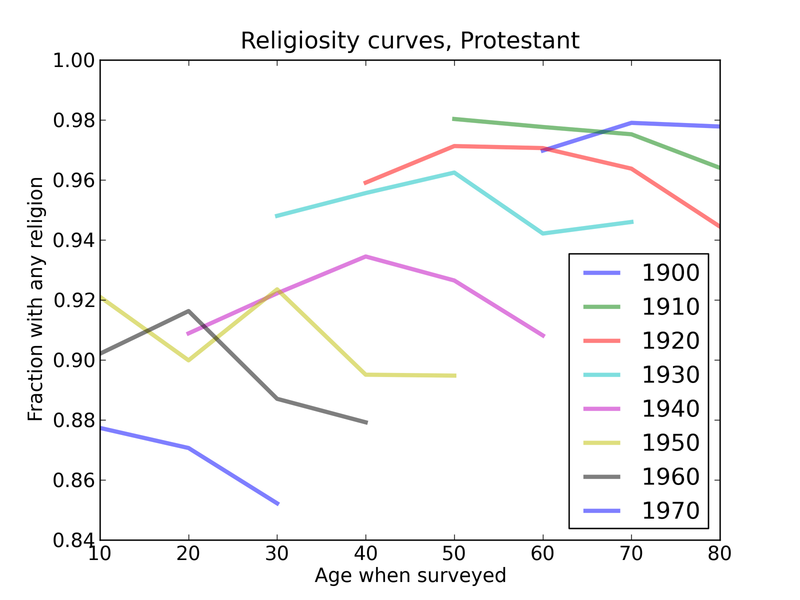 To be more thorough, a discontinuity regression method could be used around a collection of disaster dates and locations. I think it was the advance of science, especially in the area of life sciences that disillusioned some people. 90s was a time of cloning and gene sequencing, these advances were right in the alley of God and I would imagine some people faced a crisis of faith after hearing about them. 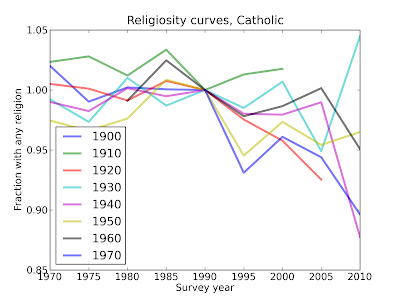 I would imagine the younger and better educated of these people to leave the church for good as a direct result of this crisis. Internet popularity spread in the 90's and millions were able to exchange ideas at a much faster rate. That's easy: In 1991, R.E.M. released the album "Out of Time", which included the hit song "Losing My Religion." Then, in 1995, after the previous year's strike had wiped out the World Series for the first time in 100 years, the Yankees returned to dominance after a decade and a half of irrelevance, thus proving conclusively that there is no god. 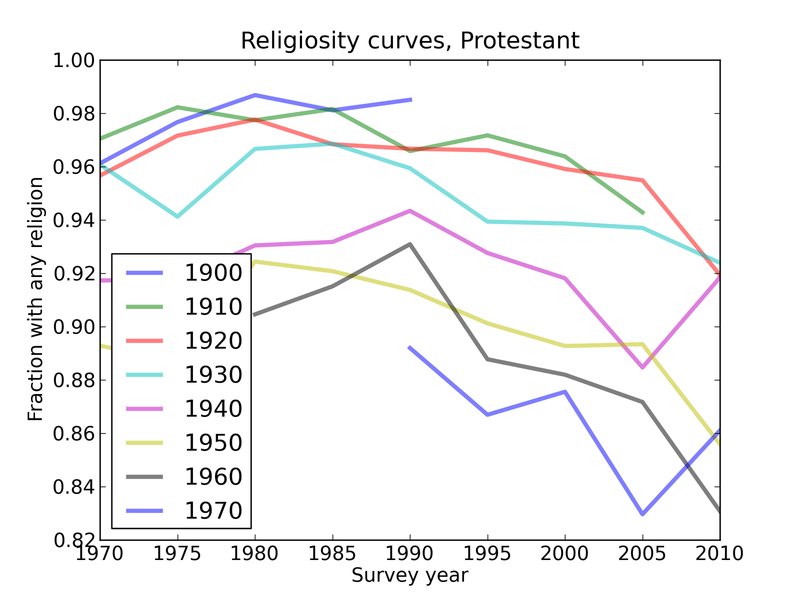 Though the argument for the return of the Yankees is incontrovertible, I have to return to the underlying theory of the causal connection of Internet usage and religiosity: exposure to other ideas. Cable TV saturation? Will see if I can get some numbers from the cable cartel. (Maybe Blockbuster really peaked in 1995!) The Religious, I have to assume, too, know their market, and 'exposure' to other voices has always been frowned upon. May need to look at when Larry Flynt triumphed with his Hustler store right in the heart of Cincinnati.